Heat enamel coated cast iron skillet (LeCreuset or Staub) and add olive oil. Add garlic and cook 1-2 minutes. Do not allow garlic to brown - it will make it bitter. Cook until chicken stock is reduced by one third. After it is reduced, add Italian seasoning. Add shrimp back into sauce while you are making the "rice". Add fresh parsley and season to taste with salt and pepper. To serve, spoon Cauliflower Rice with shaved Brussels Sprouts into low dinner bowls. 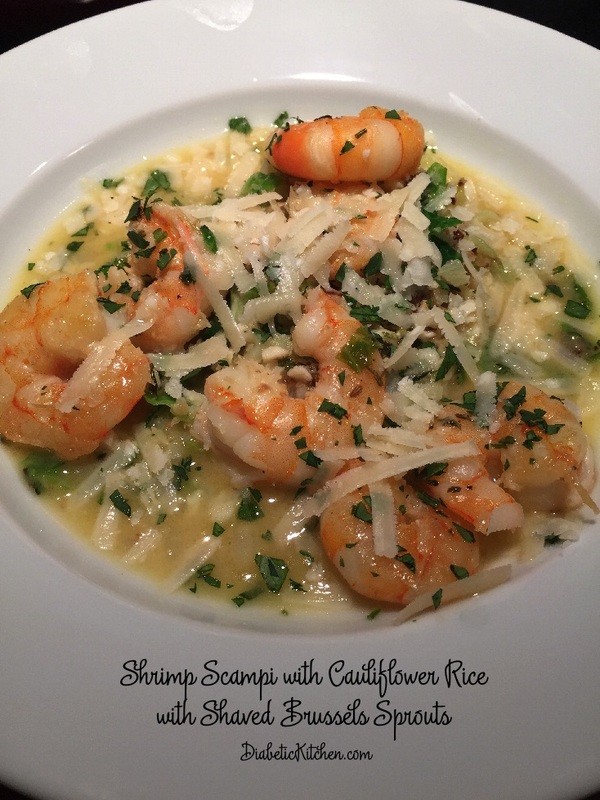 Top with Shrimp Scampi. If you do not have an enamel coated cast iron skillet use a stainless steel pan. You should not make a butter sauce in a non coated cast iron skillet.